When his wife unexpectedly passed away in 2010, Chan Wing Chun (陳榮峻) was heartbroken and fell into depression. Lonely and depressed, the 62-year-old TVB actor even considered ending his life. Fortunately, Chan Wing Chun met Helen Ng (吳香倫) in 2014 while filming Gilded Chopsticks <食為奴>. Although his children were initially put off by the relationship, feeling that their father’s new romance betrayed their deceased mother. However, his children soon realized that it was a blessing for their father to find love again and accepted Helen into the family. After dating for three years, Chan Wing Chun successfully proposed to Helen at the 2017 TVB celebratory banquet with the help of Priscilla Wong (黃翠如). He got down on one knee in front of hundreds of colleagues and successfully put a ring on Helen’s finger. Since Helen has never been married before, Chan Wing Chung hoped to give Helen an unforgettable wedding. The wedding ceremony will be held at a church, where Helen will walk down the aisle in a white wedding dress. Later in the evening, Helen will be welcoming guests in a traditional Chinese qun kwa dress at their Chinese-style banquet reception. The couple will host approximately 30 tables. 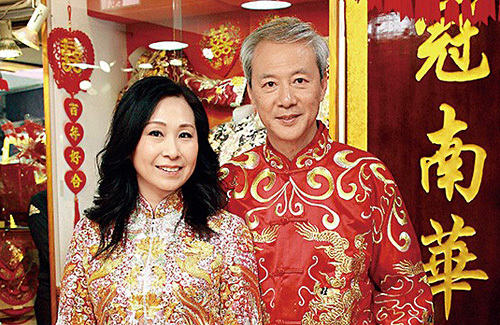 The soon-to-be newlyweds will have a sponsor for the traditional Chinese wedding outfits. Appearing at a promotional event for the dress company recently, the two were seen happily in love admiring and trying on different types of wedding attire. The bride-to-be wore one of the traditional dresses embroidered in gold thread, while the groom looked festive in a red wedding cheongsam. Very happy for them and it shows that it is never too late to get married and find love in life. Such a lovely couple. Let’s hope it’s Edwin turn to kneel down?